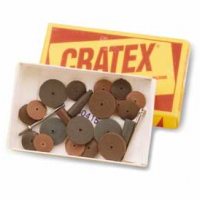 Each Cratex size and shape is made in four standard grit textures or compositions which differ in accordance with the mesh size of the abrasive grain used. Bullets measure 25.4 x 7.1mm For use with light pressure at much less than 25,000 RPM maximum safe speed. 1/16" (1.6mm) holes for use with mandrels MATEMP3 (Short thread) or MATEMP4 (Long thread). Sold in packets of 3 or 12, and boxes of 100. Measures 6.3mm diameter x 21mm length for use with light pressure at much less than 25,000 RPM maximum safe speed. 1/16" (1.6mm) holes for use with MATEMP4 (Long thread). Sold in packets of 3 or 12, and boxes of 100. Available in two different sizes both with (1.6mm) centre hole and can be used with mandrels with (2.4 or 3.2mm) shank in power tools with safe maximum speed of 25,000 RPM. Sold in packets of 3 or 12, or boxes of 100. Available in two different sizes). Supplied with 1/16" (1.6mm) center hole and can be used with mandrels with 3/32" or 1/8" (2.4 or 3.2mm) shank in power tools with safe maximum speed of 25,000 RPM. Sold in packets of 3 or 12, or boxes of 100. 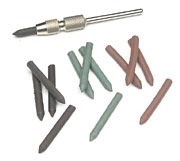 Perfect for reaching very narrow areas, these rubber points are only 3mm in diameter. Essential for touching up prongs. Provided in packages of 3 or 12.